This book is about the question of existence, the meaning of `life'. It is an enquiry into the contemporary human situation as disclosed by television. The elementary components of any real-world situation are place, people and time. These are first examined as basic existential phenomena drawing on Heidegger's fundamental enquiry into the human situation in Being and Time. They are then explored through the technological and production care-structures of broadcast television which, routinely and exceptionally, display the situated experience of being alive and living in the world today. It shows routinely in the live self-enactments of persons being themselves and the liveness of their ordinary talk on television. It shows exceptionally in television coverage of great occasions and catastrophes as they unfold live and in real time. 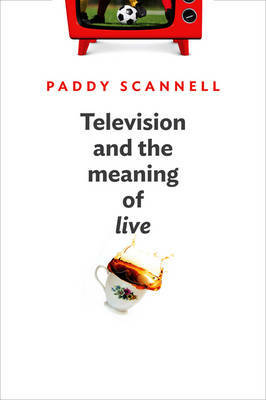 Case studies reveal the existential role of television in salvaging the possibility of genuine experience, and in revealing the world-historical character of life today. To explore these questions, the agenda of sociology - its concern with economic, political and cultural life - is set aside. Being in the world is not, in the first (or last) instance, a social but an existential question, as an existential enquiry into television today discovers. Passionate and sweeping in scale, this new book from a leading media scholar is a major contribution to our understanding of the media today.